This season, give yourself the gift of size with fitness model Abel Albonetti's 4-week muscle-building program. You'll work hard, eat hard, and grow like a weed! Let's be honest: The scale-busting bulk of the IFBB greats is simply too freaking huge for most of our likings—and that of our partners. But just a little more muscle than we have now is almost always a welcome thing, and as fitness model Abel Albonetti attests, that four-week window between Thanksgiving and Christmas is the ideal time to build it. For the rest of the year, Albonetti walks the earth at a sliced-to-the-bone 178 pounds. But when the weather starts to turn, the Mississippian launches his once-a-year mass-gain program, thus putting extra holiday calories to maximum use. 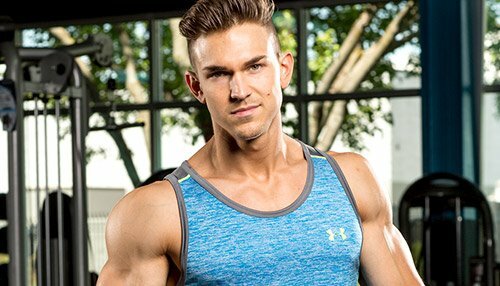 This former struggling hardgainer shared his program with us, as well as his tips for making the nutrition of mass gain finally make sense. Albonetti favors high-volume workouts for most of the year. But during his brief bulking period, he switches to the tried-and-true model of hitting every muscle group twice a week: once heavy, once light. "I focus on compound movements, working each muscle group—except arms—twice per week," he explains. "In the first workout of the week, I lift heavy using strength-oriented movements, and later that week, I lift lighter for more reps, with a hypertrophy focus. Both elements come together to force your body to change." Albonetti hits both biceps and triceps once per week with a mixture of both high and low repetitions. Albonetti's heavy day consists of 6-8 sets per exercise of 4-8 reps. His light day includes 4-5 sets of 10-20 repetitions per exercise. Each day, he uses a weight that takes him near or to failure. He leaves nothing in the tank after each set! The way you split your training is up to you. His only suggestion is to "lead the week with the body parts you want to really bring up." If you need a place to start, use his split. This is mean to be a flexible program—to a point. You're going to be in the gym almost every day, so it will help to have multiple options based on equipment availability. Mix and match based on your time and energy level, but use these rules to guide you. On the heavy day, use as many of the primary exercises as you can. They're more or less non-negotiable. If you don't hit any of the assistance exercises on those days, it's OK.
Albonetti sticks with his staple compound movements pretty much year-round, but he rotates his assistance exercises regularly. You can still start with a compound movement if you want, or if you're not feeling totally recovered, use a "kitchen sink" approach on your light day, get a great pump, and do lots of reps.
Albonetti sticks with his staple compound movements pretty much year-round, but he rotates his assistance exercises regularly. Here are your movements. 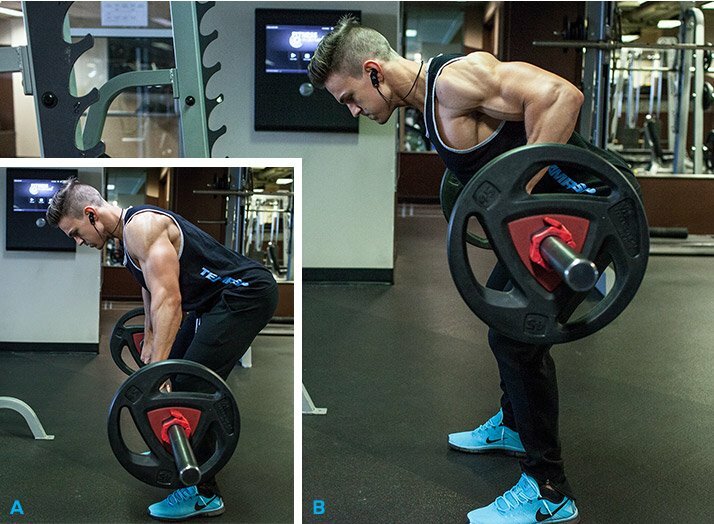 If you want examples of how to put them together, Albonetti's Fitness 360 and his Ultimate Back Workout video are great places to start. "I've always been a hardgainer, so I know how difficult it is to gain muscle," Albonetti admits. "To counter that, the first step is to implement a truly challenging workout program like the one I've outlined here. All the clean calories and supplements in the world won't help you get bigger without putting in the hard work at the gym." Next, of course, comes the part that so many people struggle to crack: optimizing the other 23 hours of the day for growth. "If you're a hardgainer, you'll want to track all of your food intake, whether you do it digitally or write it down in a notebook," Albonetti instructs. "It's fairly easy to get people to do that when they're trying to lose weight, but it's just as important, if not more so, when the goal is gaining. So get serious about it right now." "I hear many guys say that they're eating so much but can't gain weight. My first question to that is, 'So how many calories are you eating?' They usually have no idea. When I have them track it for a few days, they find out they've been eating 500 to 1,000 calories less per day than they estimated." "All the clean calories and supplements in the world won't help you get bigger without putting in the hard work at the gym." When in muscle-building mode, Albonetti makes sure to bank 1 gram of protein per pound of body weight per day. That will be your highest priority for these four weeks, so do what is necessary to measure it and get it down the hatch. For him, that means 180 grams—and that number is non-negotiable. "I cycle my carb intake year-round, but loosen it up a little during this annual four-week phase. I include two low-to-medium carb days followed by one high day, and then repeat the cycle," he says. "On the low day, I eat about 60 grams of carbs a day, focusing on fibrous carbs like vegetables. On the high day, I have anywhere between 300 and 600 grams of carbs. My fat intake stays about the same no matter what, around 0.5 grams per pound of body weight daily (about 90 grams per day)." That's a lot of carbs—probably more than you're used to eating. But they're crucial for getting adequate calories and powering your high-volume workouts. So if you've been waiting to start counting your macronutrients, now is definitely the time. Albonetti has figured out how to fit all these macros into three whole-food meals and two shakes a day. You may need an extra protein-rich meal to make it work, particularly if you're not accustomed to eating adequately for growth. Your training and diet will largely determine your success during these four weeks. But if you haven't been getting enough protein—which is likely, if you're frustrated and thin—a couple of shakes a day are a no-brainer. "My supplement regimen is consistent, whether I'm trying to build muscle or lose body fat," Albonetti says. "A good whey protein powder and creatine are both musts. So is a quality fish oil and a well-formulated multivitamin. All the calories you're taking in will handle the rest." On your low-carb days (if you choose to cycle), take your shakes in however you can. On high-carb days, fortify one or both of your shakes with oats and a healthy scoop of nut butter. This extra blast could make all the difference. SHOP RSP Nutrition IN OUR STORE!